Traffic Management Inc.'s 'Shuttle Xing' road sign as seen at Los Angeles International Airport, Oct. 12, 2012. It is hard to upstage something as large and unusual as a space shuttle moving through the streets of a major city, but an orange and black road sign that signaled the shuttle's crossing almost did. Now, that scene-stealing, diamond-shaped "Shuttle Xing" sign can be yours, direct from the traffic control company behind its creation. As the shuttle Endeavour rolled for three days through the streets of L.A., from Los Angeles International Airport to the California Science Center, Oct. 12-14, the millions who turned out to watch the museum-bound orbiter pass by photographed the winged spacecraft from every angle. Many also took notice — and snapshots — of the 4 by 4 foot (1.2 by 1.2 meters) custom aluminum road signs that were placed along the space shuttle's route. 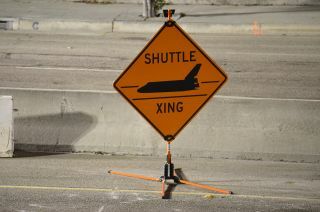 The reflective orange markers featured a black silhouette of the orbiter in profile and the words "Shuttle Xing," or "Shuttle Crossing." "We love this road signage!" the California Science Center (CSC) wrote on Twitter, in response to a photo of one of the signs that was taken by collectSPACE.com outside of the airport. The same "Shuttle Xing" traffic sign was present outside the landmark Randy's Donuts where Toyota was filming its Tundra pickup truck towing the Endeavour across the 405 freeway, and on news sites such as CNN.com. The sudden popularity of the sign inspired miniature and full-size knock-offs to be offered on eBay, fabricated in aluminum and in plastic. Replicas of the simple but iconic design quickly showed up for sale on buttons and bumper stickers. Now the signs' original creator, Traffic Management, Inc., has begun selling the "official traffic sign" for the science center's "Mission 26: The Big Endeavour" parade through its traffic products online store. The souvenir signs, all produced out of 0.063 inch (0.16 centimeter) aluminum, range in sizes from a foot (30.48 cm) to the full-size 48 inches (1.2 meters). Prices for the six different sizes of signs offered range from $25 to $175. Retired shuttle Endeavour passes a Taco Bell at Martin Luther King Jr. Blvd. and Normandie Ave., Oct. 14, 2012. As for Endeavour, it won't be needing any further crossing signs, at least not for the next several years. Offloaded from its four self-propelled, computer-controlled transporters that delivered the shuttle for display to the California Science Center, the orbiter is now housed inside the new Samuel Oschin Space Shuttle Endeavour Display Pavilion. The exhibition hangar opens to the public on Oct. 30. Endeavour's next and final move won't come for another five years, when the CSC plans to have ready the space shuttle's permanent exhibit inside the still-planned Samuel Air and Space Center, opening in 2017. For more information or to order the "Shuttle Xing" signs, see Traffic Management, Inc.'s Traffic Products Store. See shuttles.collectspace.com for continuing coverage of the delivery and display of NASA's retired space shuttles.